Hello everyone! It's Berina here today with 2 cards using the beautiful Lift Up Balloon stamp set. 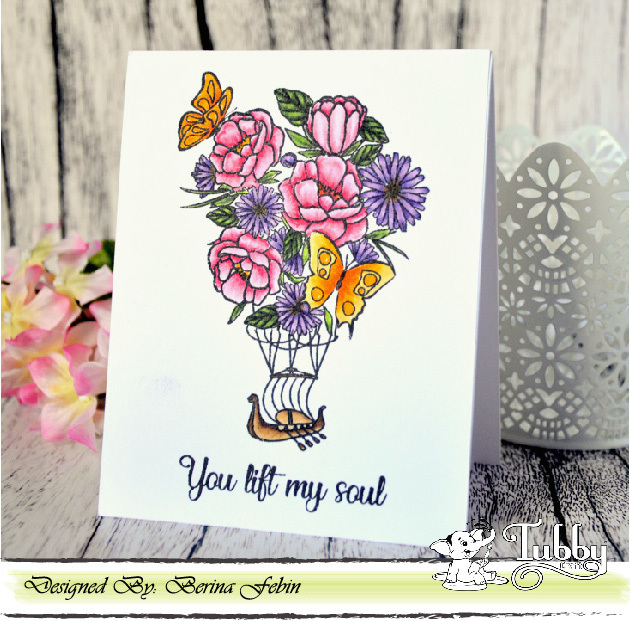 This set is so versatile in that it can be used as a hot air balloon and flowers can be used by themselves. I will be showing both ways today. Stamp the flowers and the lower part of the hot air balloon with the Tubby Craft Black ink. Color the image with markers. I used Copics - RV14, RV13, RV21, RV10, V09, V17, V15, V12, YR68, Y38, YR31, E59, E57 and E53. Stamp the sentiment with the Tubby Craft Black ink. 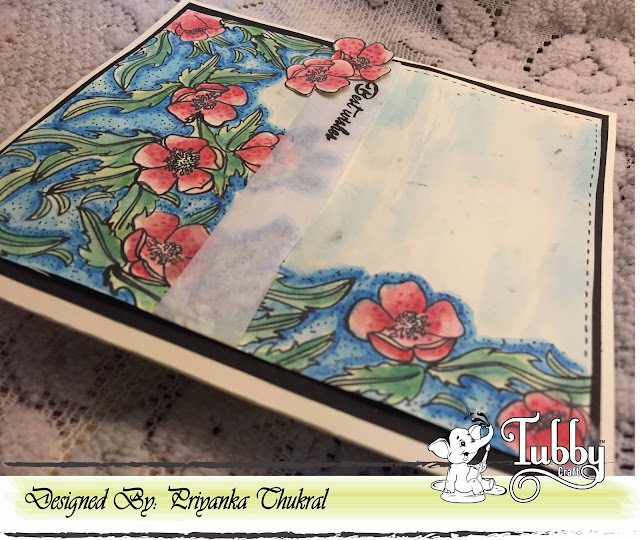 Adhere the panel on to a top folding A2 card base. The Tubby Craft inks works well with Copic markers. As you see, there is no smudging. Here's another pic of this card. For the second card, I decided to try watercoloring on gold embossing. Gold emboss the flower image multiple times, along the left and the right edge of the watercolor panel. Gold emboss the sentiment from Fancy Sentiments. 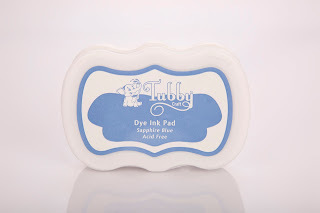 Watercolor the image with Tubby Craft inks. I used the Imperial Red and Tangy Orange for the flowers, Hot Pink and Light Pink for the butterfly and I mixed Lemon Yellow and Sapphire Blue for the greens. I pressed the ink pad on to acrylic block and used a wet brush to watercolor the image. I inked the edges of an A2 card base with Tangy Orange ink and adhered the watercolored panel on to it. These inks are so lovely to watercolor. I love the bright and lovely colors. Thanks for stopping by. Have a great day! Today, I am sharing three projects I made using the Buttercup set. 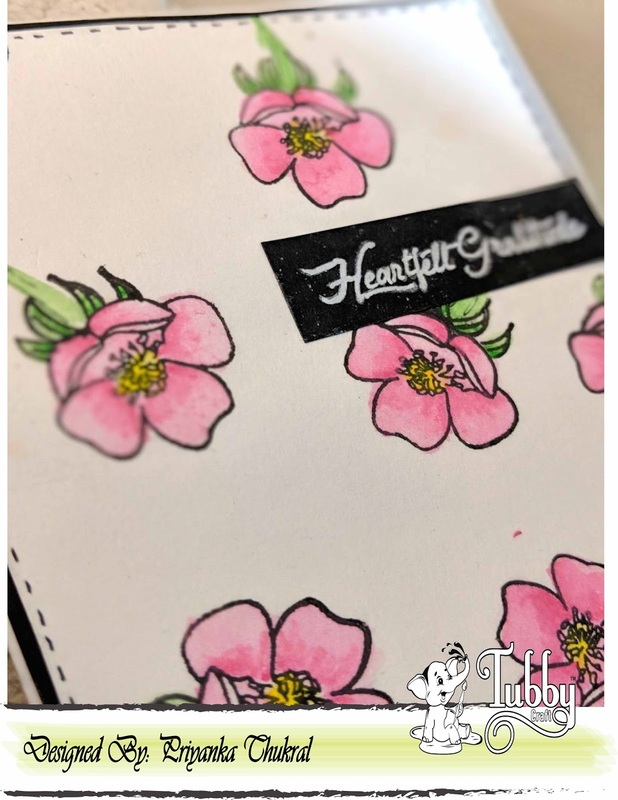 I absolutely love working with floral images, and the Buttercup set has some really pretty florals which are perfect for coloring and layering. Here's a look at what I have created using this set. To create my card, I first stamped a bunch of flowers and leaves from the Buttercup set using black dye ink on watercolor paper. 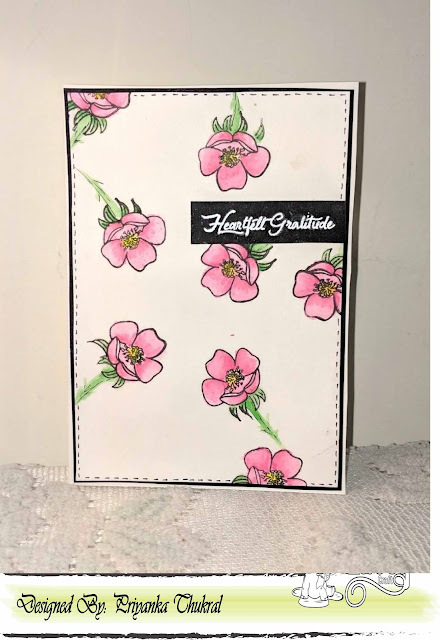 After stamping the images, I watercolored them using my Zig Clean Color Brush Markers in shades of pinks and blues for the flowers, and green for the leaves. Then I fussy cut the images and put them aside. Once the images were ready, it was time to work on my background and card base. 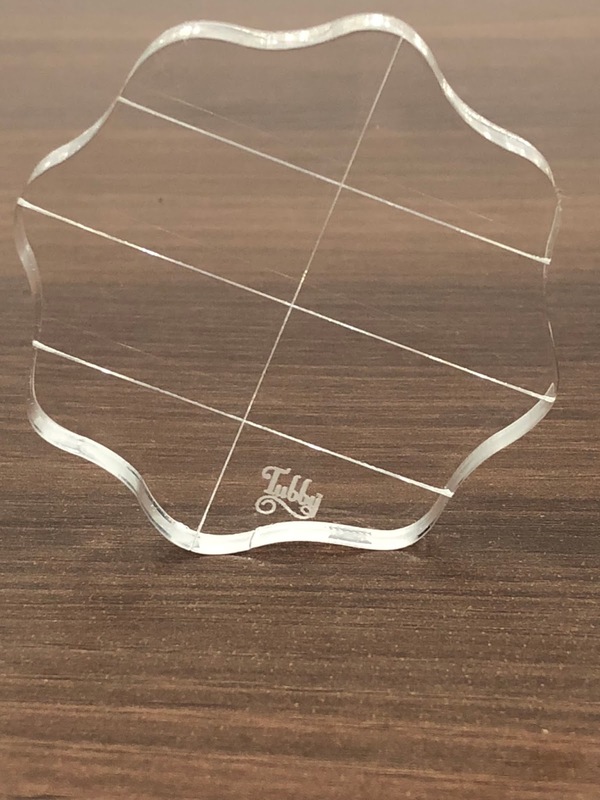 For this, I took a card panel roughly measuring 4 1/2 inches by 5 inches and created a die-cut window in the center of it using a Spellbinders die. 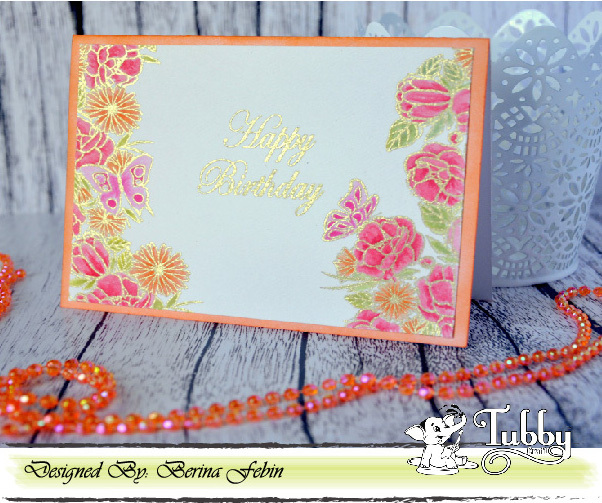 Next, I did some stenciling on my card base using a yellow ink and an iCraft Lattice stencil. 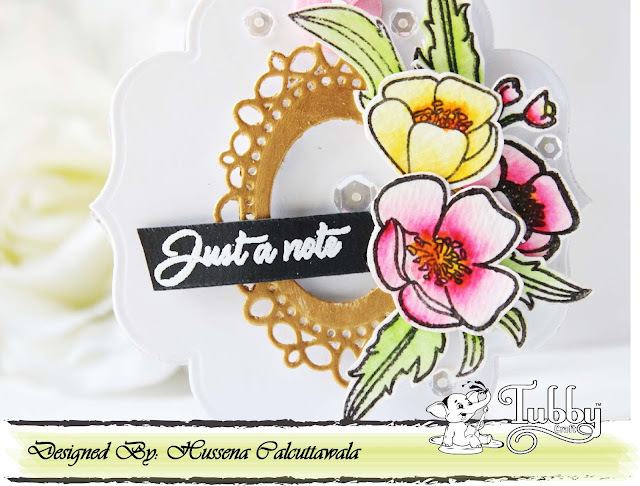 I kept my stenciling confined only to the center of my card where the die cut window would be placed. Then, I did my floral arrangement using the previously fussy cut images on my die cut window. 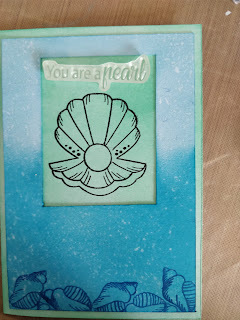 Finally, I heat embossed my sentiment (which is from the same Buttercup set), on a strip of black cardstock using Super Fine White embossing powder. As a final touch, I added some paint splatters using black acrylic paint. 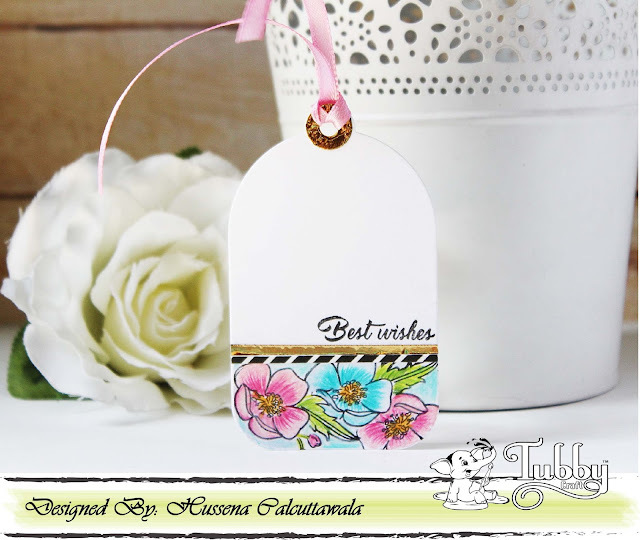 Next up is a tag I created using the same Buttercup set. I have kept it a single layer one, and have done some masking and pencil coloring on this. 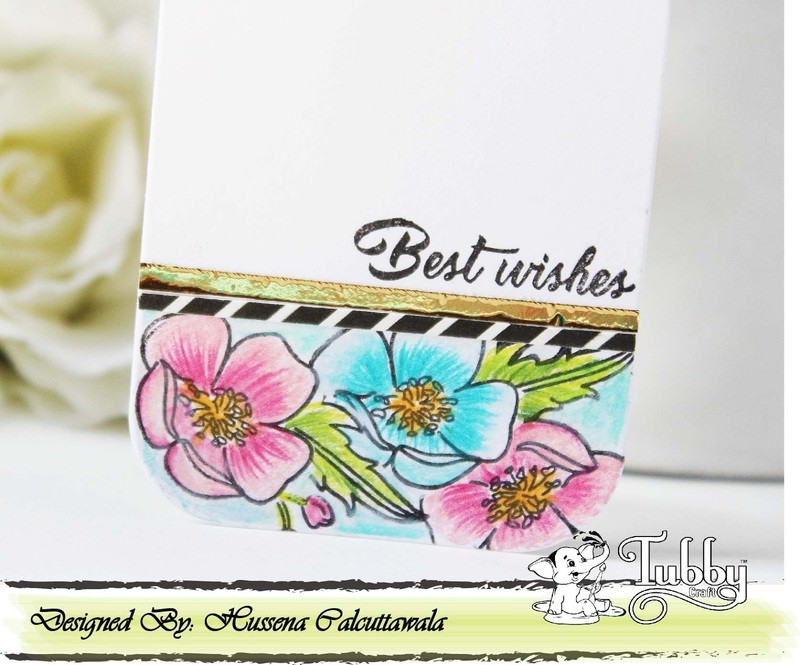 To create this tag, I first stamped and masked the floral images from this set on the base of my die cut tag. Then, using my Prismacolor pencils, I did some simple coloring of the images. 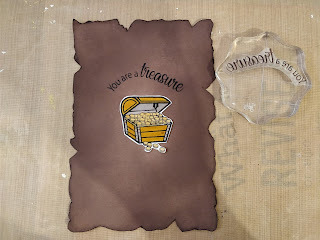 Once my stamping and coloring were done, I added a thin strip of black and white striped pattern paper above my image, as well as a thin strip of gold foil paper to further embellish it. 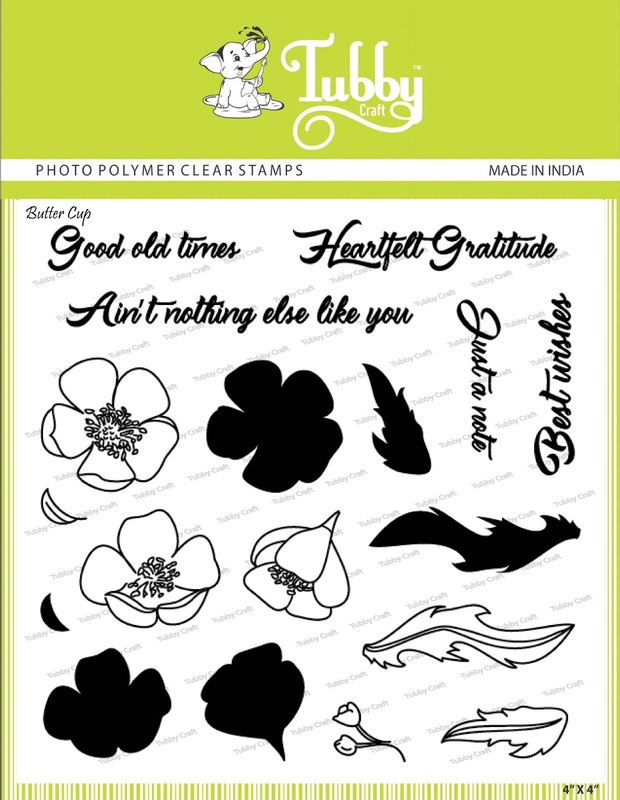 Finally, I stamped the sentiment above the foil strip which is from the Buttercup set. 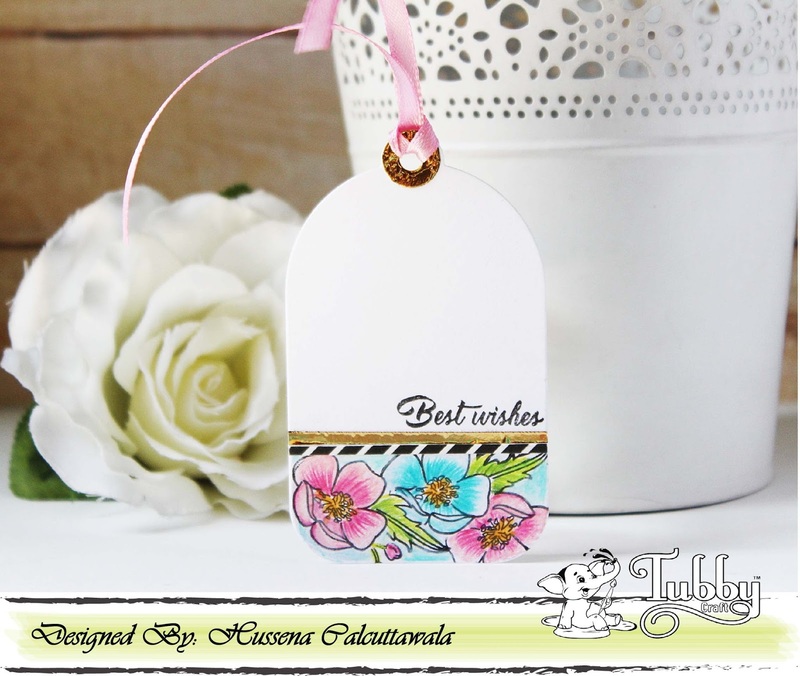 My final project is also a gift tag, and here I have created a layered tag. 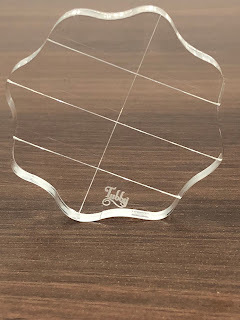 To create this tag, I first die cut my base using a shaped die. I have used two tags here so that the recipient can write the message on the inside. To embellish the front of the tag, I used an ornate frame in the center which was die cut using a Spellbinders die and colored using Inka Gold Old Gold. 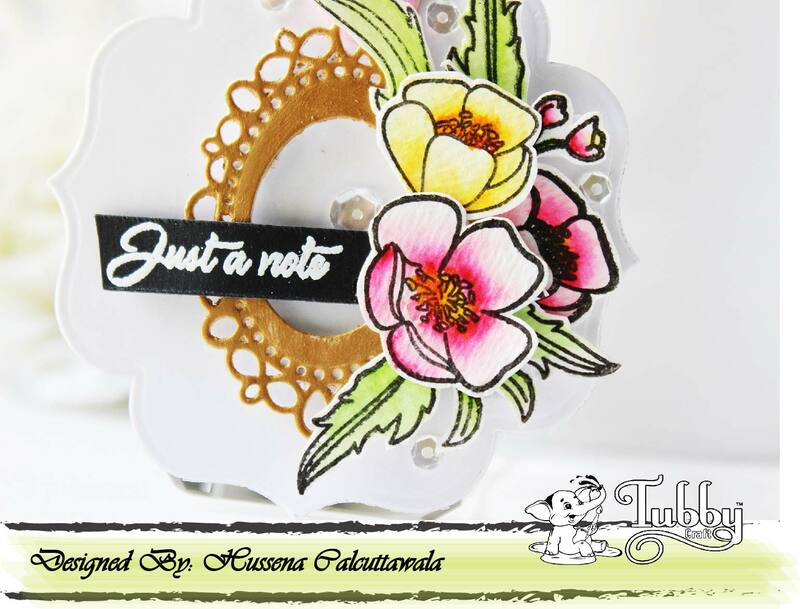 I used some stamped and colored, florals and leaves from the Buttercup set to create my floral cluster. 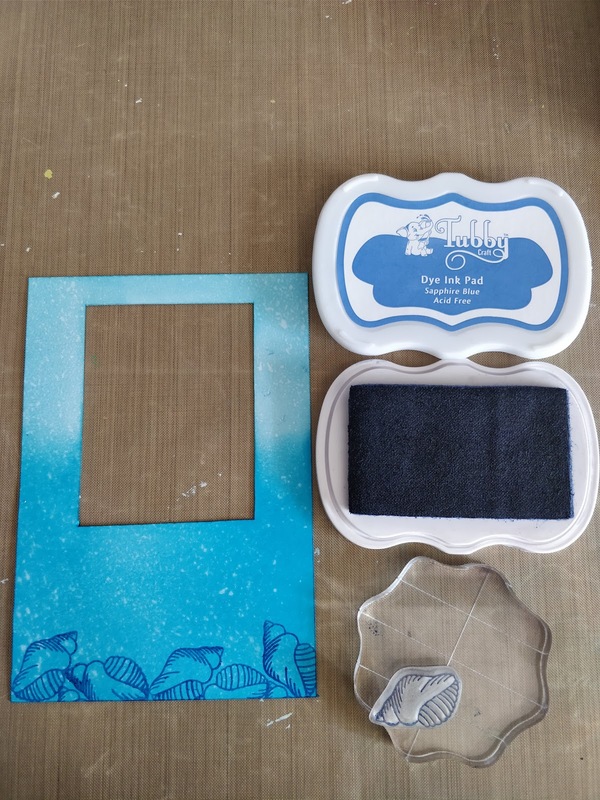 I then added my heat embossed sentiment on the side of the frame. Finally, I added some clear sequins to finish off my tag. 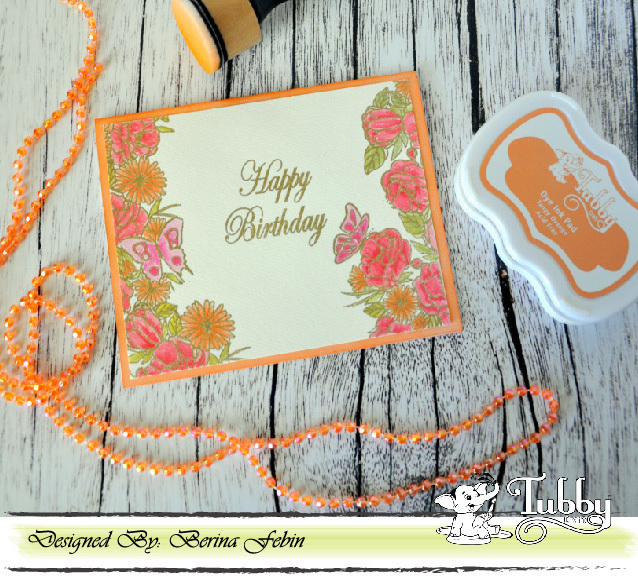 I hope you like my projects created using the Buttercup set and are inspired to create using this set. If you have any doubts or queries regarding my projects, please leave me a comment, and I will get back to you soon. 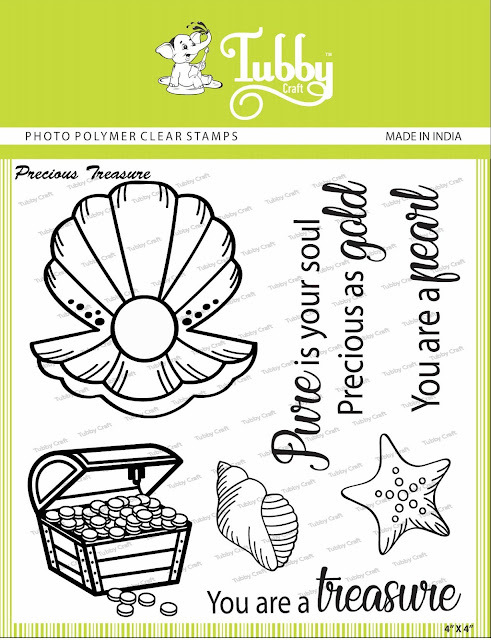 Let's find some pearls and treasure..
Devika here and today I am sharing the different ways in which you can use the stamp set from February release, Precious Treasure...the moment I saw this stamp set, I fell for it! There are just endless ways in which you can use it. 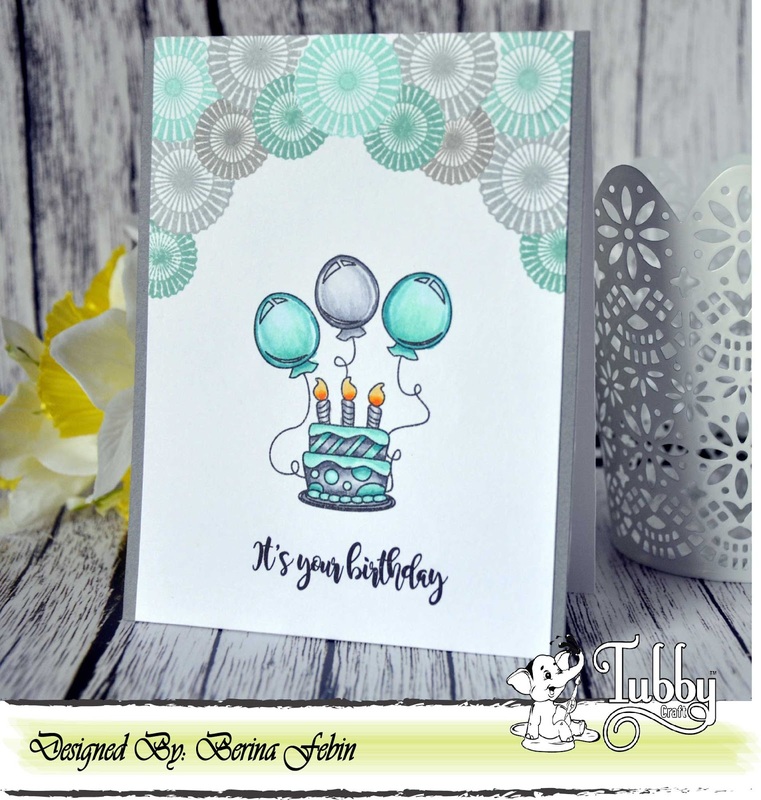 I will also be sharing how you can use the different coloured Tubby Craft ink pads to create wonderful backgrounds and stamped images! 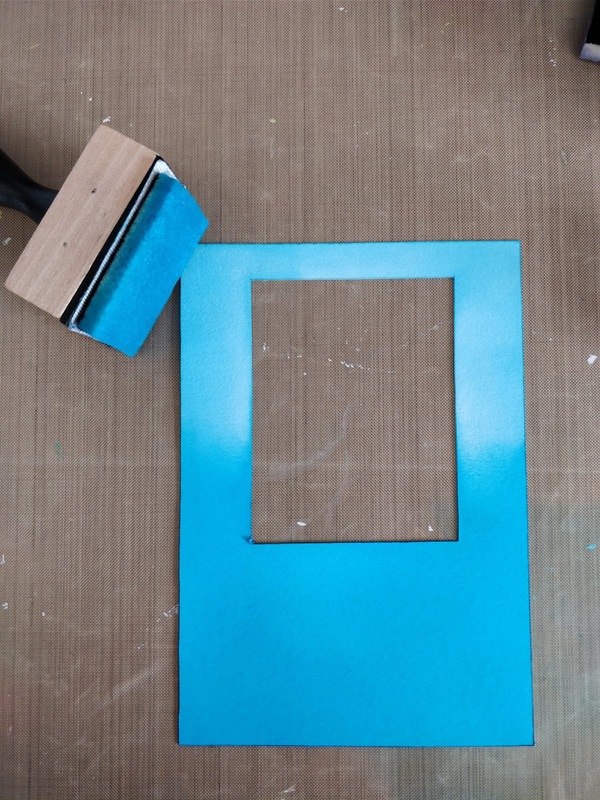 - Cut out a small rectangular window in a piece of white cardstock. -I wanted to give it a "sea theme" hence opted for 2 shades of blue distress inks. Blend them together by giving a darker shade at the bottom and lighter shade at the top. -Sprint some small water droplets on the card and immediately lift it with a cloth/paper towel, to give it the bleached effect. 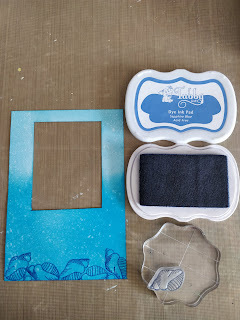 -Now the favourite part begins... stamp the sea shells with Tubby Craft Ink- Sapphire Blue at the base. 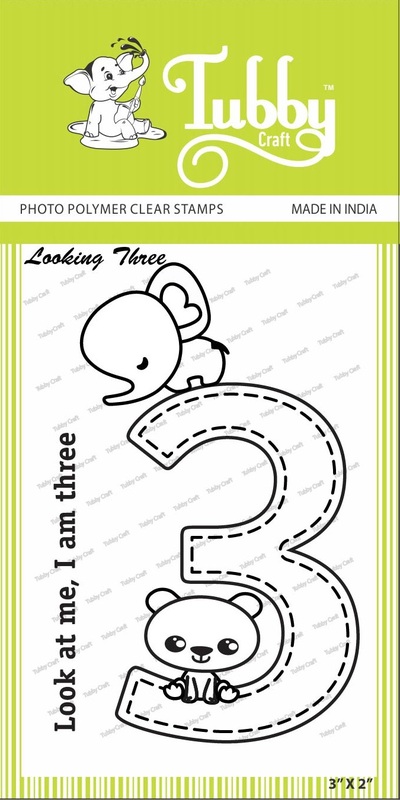 -For the base card, cover it with another shade of ink/colour. -Position the Pearl stamp along with the sentiment and stamp it using Tubby Craft Ink- Jet Black. 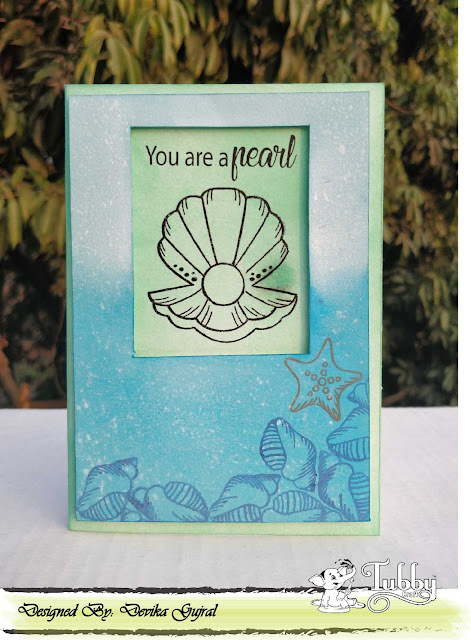 -Foam mount the pieces...and you have a beautiful sea themed card. 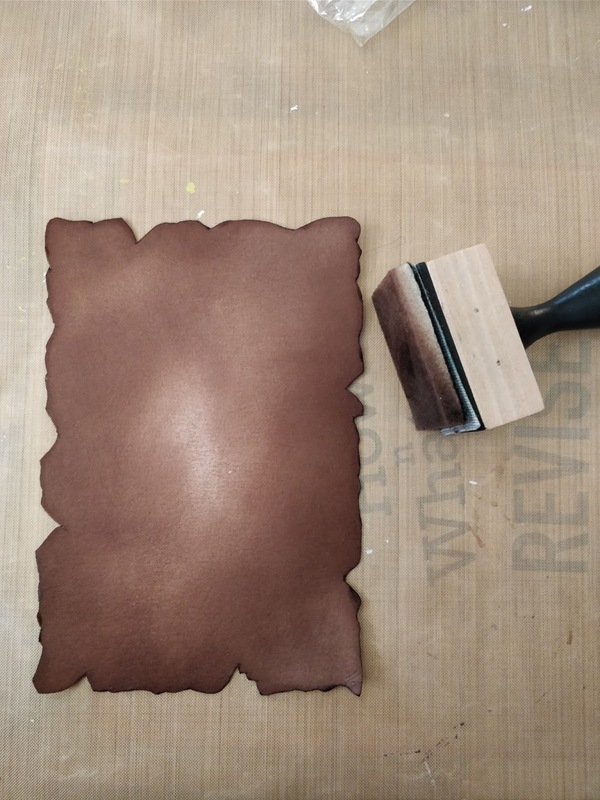 -Cut the paper at the edges to give it an ancient, worn out map type of a look. 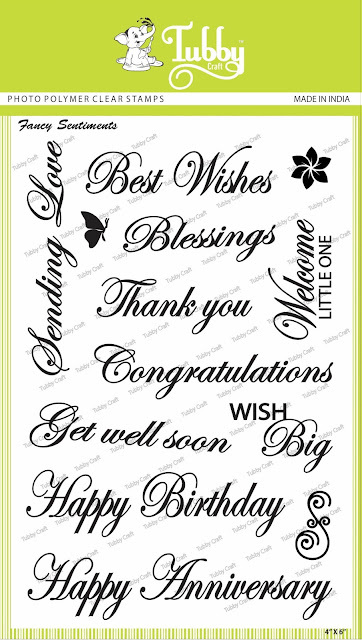 -Blend this cardstock with a brown ink. - Stamp the TREASURE stamp and fussy cut it. Colour it with any medium you are comfortable with. 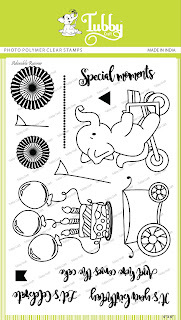 - Bend the sentiment in a semi-circle shape and stamp it using Tubby Craft Ink- Jet Black.YES, you can bend these stamps in anyway you like to suit your need! - Stamp the track using the stamp set from Adorable Runner, the bird from Talking Two and the Ship from Lift up Balloon. All these stamps just completed the look flawlessly. - Colour another cardstock base with yellow ink/colour. Hope you all loved these 2 different card inspirations for this february release. Do leave your precious comments below and I will be back next week with 2 more cards using another stamp set from Feburary release! We are overwhelmed with the love all of you have showered for Part 1 release. Thanks a ton! Such appreciation means a lot to us. So, without holding for long, we are here with Part 2 of February release. Today, we are launching 6 new and versatile designs to add to our photopolymer stamps collection. Tubby Craft's acrylic block with guidelines are perfect for comfort stamping with excellent gripping. You can check February Release Part 1 here. Do let us know your favourite products in the comments below. Follow us on Instagram and Facebook for more products and inspirations. Hello everyone! 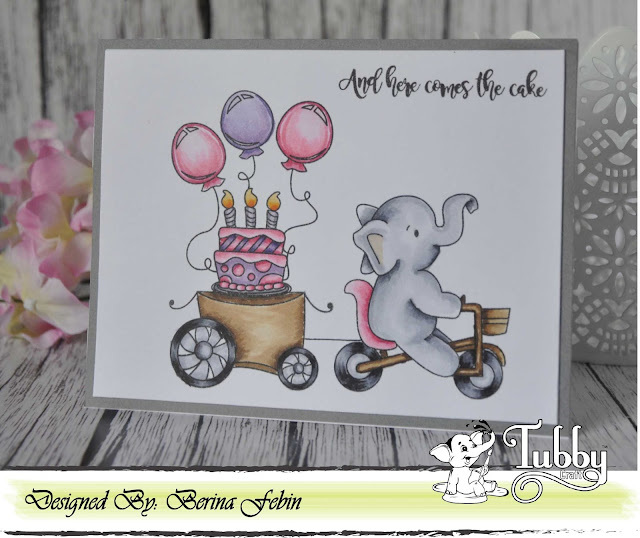 It's Berina here today with 2 Birthday cards with the birthday cake from the Adorable Runner stamp set. 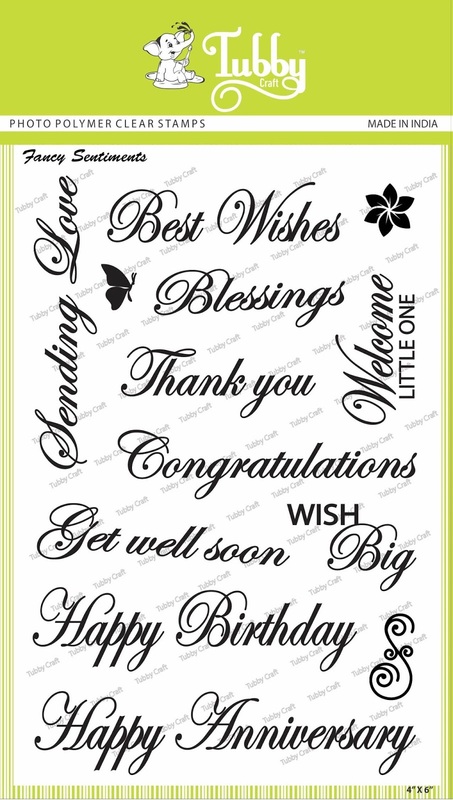 Stamp the cake image on a piece of white card stock of size 4" x 5 1/2"
Cut out masks of the rosette images, 1 for each. 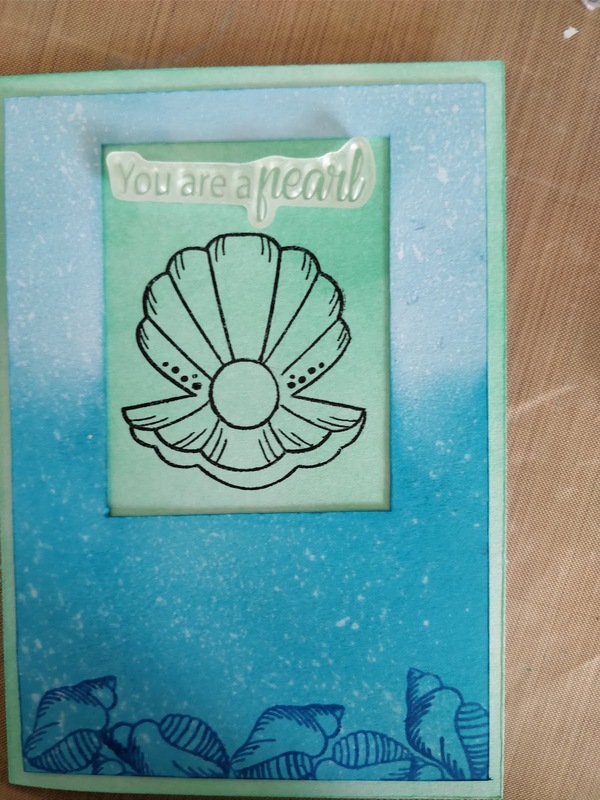 I used 2 shades of teal and 2 shades of grey to stamp the rosettes. Starting from the center, stamp the rosettes by changing the ink color amd masking the previously stamped ones. Stamp the sentiment below the cake. Color the image with markers. I used Copics - BG49, BR 15, BG13, BG11 and BG000 for the teal, C7, c5, C3 and C1 for the grey and YG68, Y38 and YR31 for the candle flame. Adhere the white cardstock on to a grey card stock piece of size 4 1/4" by 5 1/2"
Adhere it on to a top folding A2 card base. I love those paper rosette stamps. So pretty, aren't they? 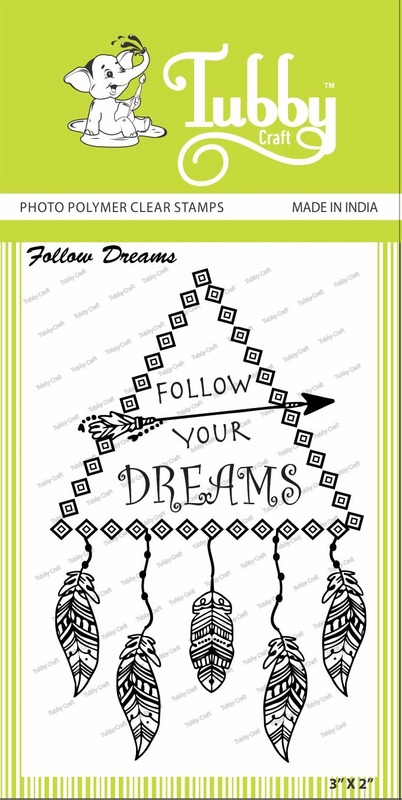 Take a piece of white card stock of size 4" x 5 1/4" and stamp all the images and sentiment. Color the image with markers. I used Copics and Stylefile markers - RV14, RV13, RV21 and RV10 for the pink, V17, V15, V12 and BV00 for the violets, C7, C5, C3 and C1 for the greys, Stylefile marker 900, C7, C5 and C3 for the black, E59, E57 and E53 for the brown and YR 68, Y38 and YR31 for the candle flame. Adhere this panel on to a grey card stock piece of size 4 1/4" x 5 1/2" and adhere that on to a top folding A2 card base. So how do you like these cards? Do let me know in the comments. Did you know that there's a giveaway going on at Tubby Craft? Visit this post here to see more details. Thank you for stopping by. Have a great day! 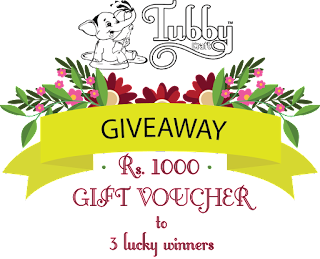 Hello and Welcome to Tubby Craft Mega Launch! 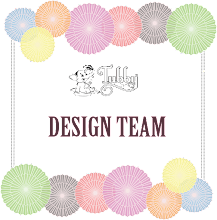 Team Tubby Craft is ready with big news for all art enthusiast, crafters and followers. The next best thing is finally here! 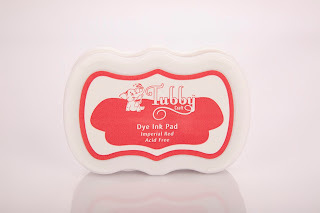 A make in india initiative, Tubby Craft brings to you premium DYE INK PADS of high quality at very economical price for domestic and international market. 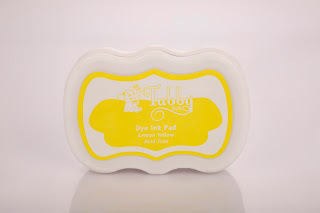 These dye ink pads are very user friendly, gives crisp impression, doesn't smear, gets absorbed and dries quickly on paper. 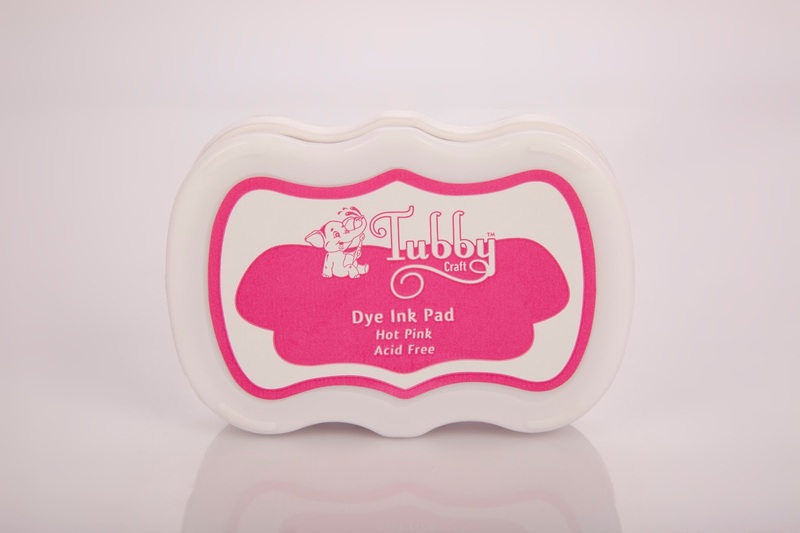 Tubby craft is offering dye ink pads in 10 stunning colours. 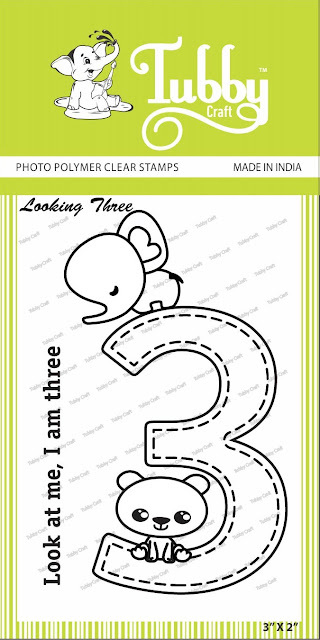 Being manufactured in India achieving the finest quality, Dye-Ink Pads are surely going to brighten up your entire stamping experience. 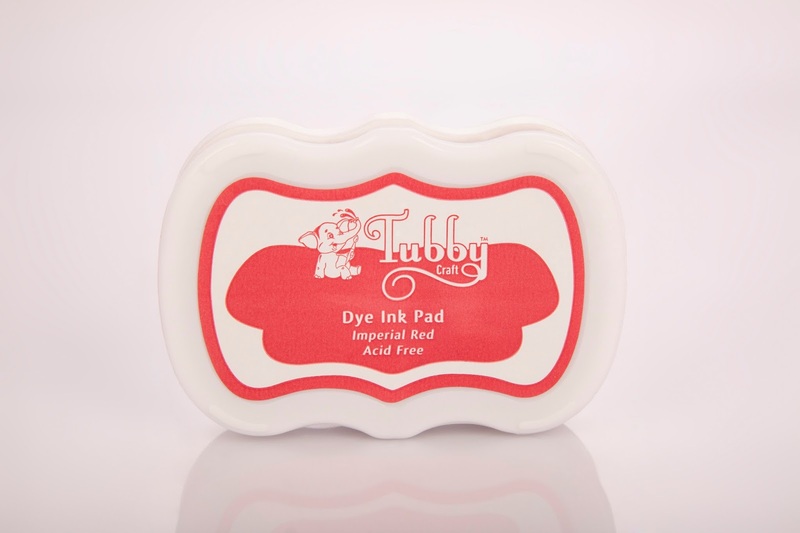 Dye-Ink pads are specifically designed for card-making, scrapbooking and for various other creative art and craft projects. 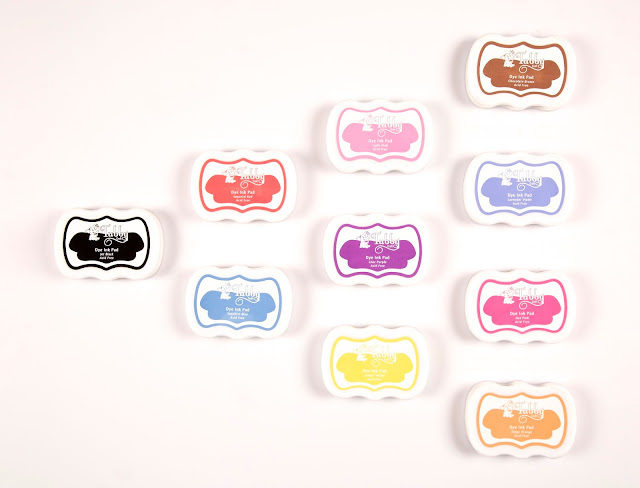 They work beautifully over all kinds of papers - regular, glossy or matte. The firm raised felt pad is suitable for inking up stamps of all kinds. We can’t wait for you to explore more! Just for the best user experience we make sure to come up with finest inks in appealing and beautiful colours that just highlight your project. 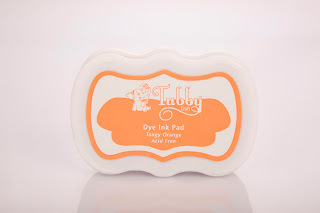 These Dye Ink Pad comes in variant of gorgeous colours. 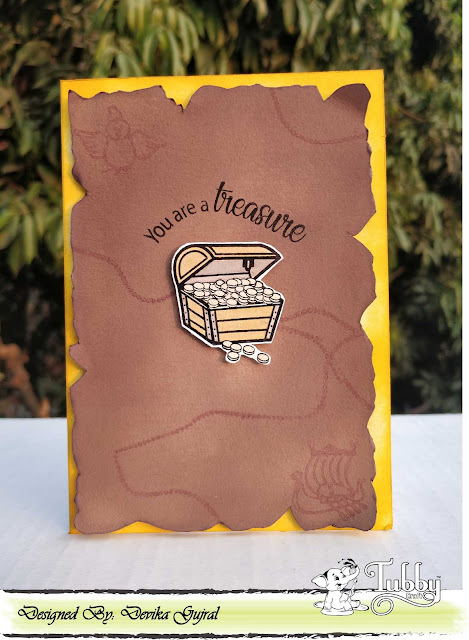 It enables you to include intense, lively hues to your paper crafts and workmanship ventures. Quick drying, dye based inks are acid free and nontoxic, so it's ideal for scrapbooks, cards, and any other creative activity. 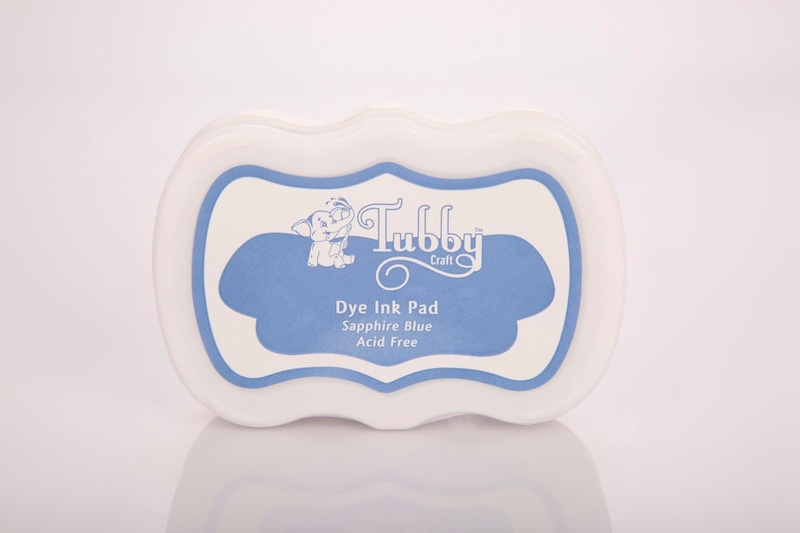 These inks can be cleaned with wipes from any surface. These ink pads comes with stackable boxes and top lid fitting to the bottom for user's convenience. So, reach for your most loved stamps and paper or card stock and let your imagination flow. 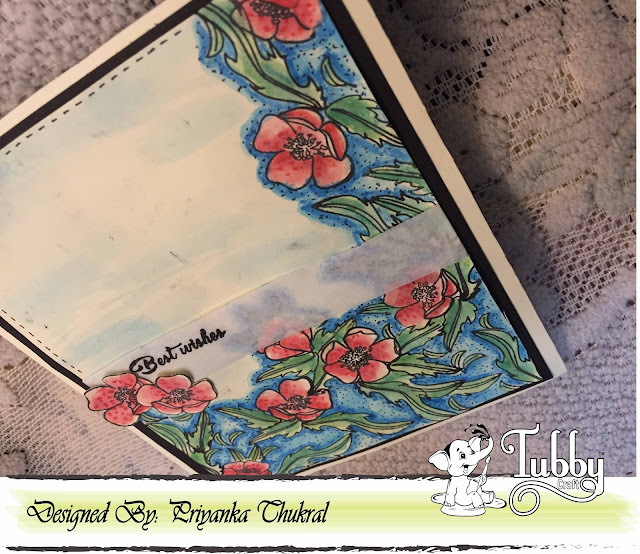 I am back again with 2 more projects today..
Card1: I have a fully loaded card using ButterCup stamp set from the store..
1. I picked one offwhite coloured card in A2 size, a black coloured cardstock in a slightly smaller size and another off white coloured card stock in a smaller size than black one. 2. 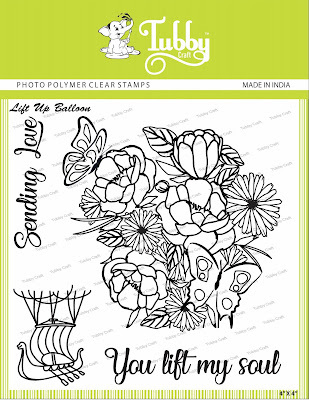 Next i stamped the flowers and leaves using "buttercup" stamp set on the smallest offwhite cardstock. 3. 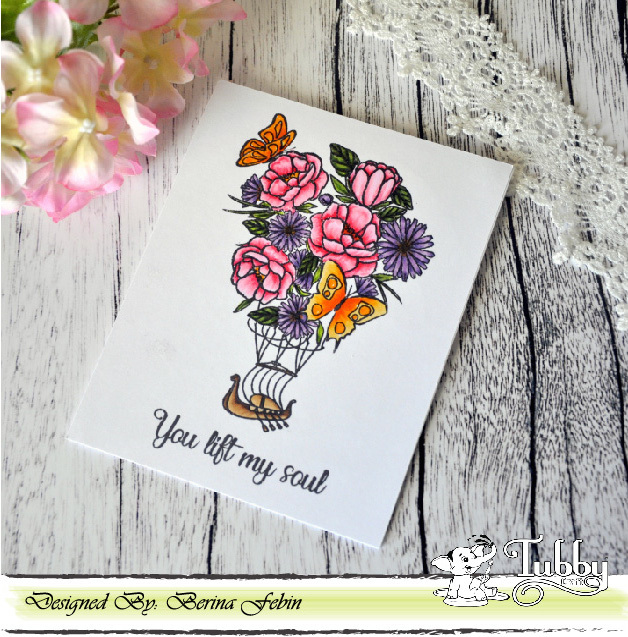 Next I coloured the stamped flowers & leaves using my Duo coloured pencils and distress inks. 5. I added butter paper in the center of the card & stamped the sentiment "Best wishes" on it using versa black onyx ink and added the fussy cut flowers on it. 6. Adhered this panel on the black cardstock and then on the base card. 7. I added stiched lines on the corners and dotted texture on the blue portion between the flowers. 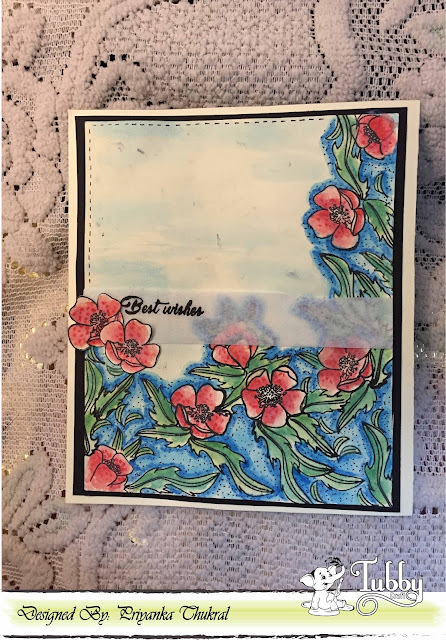 For the second card I used the same stamp set. 1. 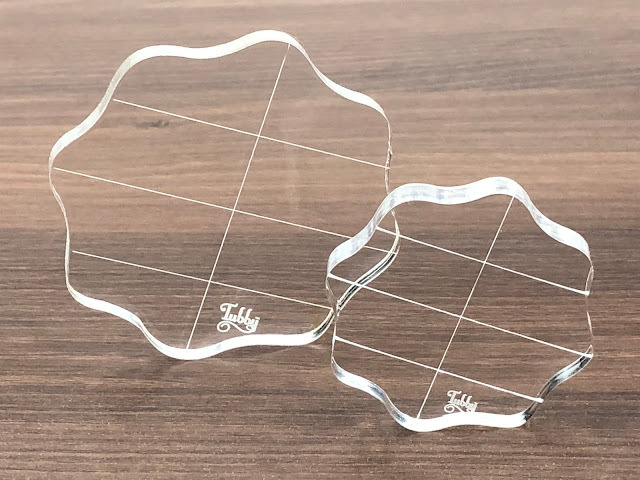 I took an A2 size white coloured card, a black coloured cardstock in a slightly smaller size and another white coloured cardstock in a smaller size. 2. 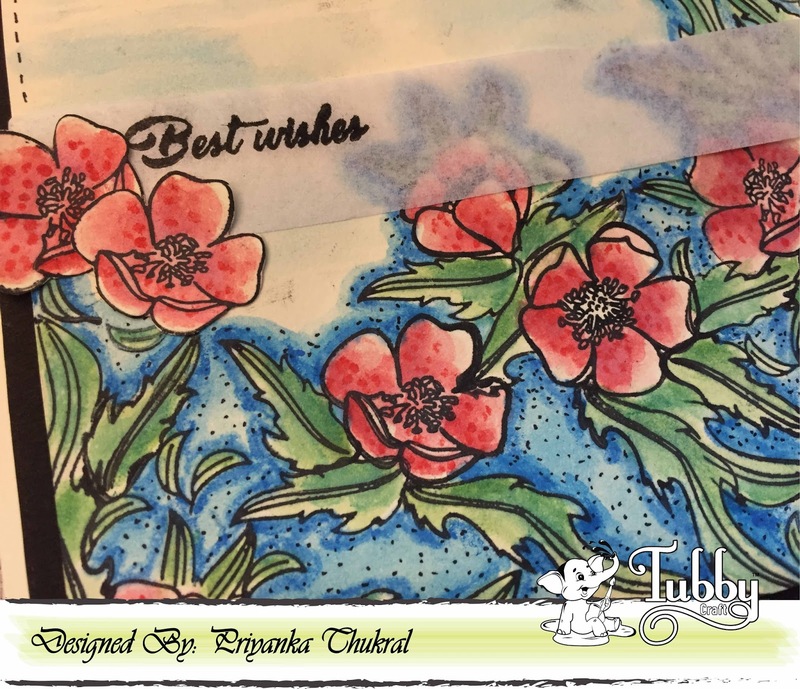 I stamped using the flower stamp from the buttercup stamp set randomly on the white cardstock. 3. 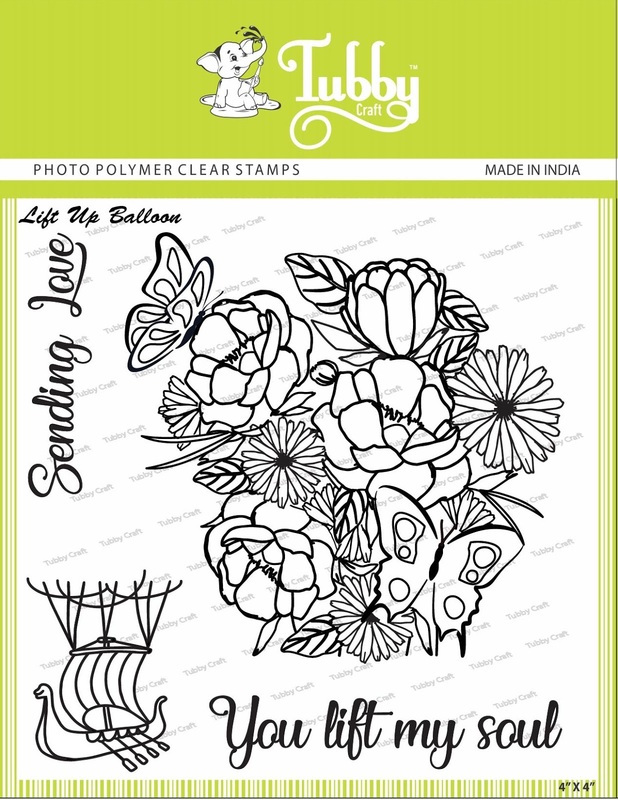 Next I took the smallest leaf stamp from the set and using the masking technique I started stamping it on the lower portion of the flowers. 4. Using my Duo watercolour pencils I coloured the flowers and leafs and added a free hand stem below the flowers. 6. I adhered the black panel on my base card & the white cardstock on the black one. & here my card is ready.!! Hope you liked both the cards.